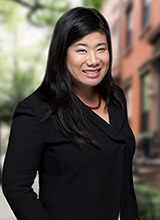 Growing up in a world of savvy real estate investment – one that helped her immigrant parents build and secure a comfortable lifestyle for their family – was only part of the Cherie Lee chose Real Estate as her career. Cherie also possesses a charming interpersonal quality that drives her towards her goal of helping others realize their own sense of security through finding that place to call home. Intelligent, extremely driven and resourceful, Cherie is a supportive and knowledgeable strategic partner to navigate the world of buying, selling or renting real estate. "As a homeowner who recently went through a renovation, I know the process from all aspects and have personally vetted a superb network of professionals to help make your dream home a reality; from attorneys and mortgage bankers/brokers to architects, contractors, designers and others," she assures her current and future clients a smooth, streamlined, and fun experience. Originally from Boston, Cherie graduated with honors from Harvard University with a degree in Biology, focusing on Exercise Metabolism. She speaks fluent English and Mandarin Chinese, is conversant in Cantonese and French, and is an active member of the Asia Society. Living and working abroad and traveling extensively domestically and internationally has given her a unique perspective on the needs of her diverse clientele. Her considerable experience working with Fixed Income derivatives products on Wall Street for investment banks and consulting firms provides valuable insight into market-based financial analysis of industry trends and benchmarks. In addition, her success in identifying her own lucrative real estate investment opportunities and managing her evolving portfolio of properties means that the client is partnering with someone who knows the world of real estate finance personally as well as professionally. Cherie has called New York City home for over a decade, and prides herself on knowing the city in which she lives and works intimately. She has lived in the Village, then Hell's Kitchen, and owns a condo in Union Square, where she still resides. Her curiosity and active lifestyle have carried her to all corners of New York, and her familiarity with the Big Apple is unparalleled. While real estate is her passion, Cherie finds time to balance life with her favorite interests. These include dining at different restaurants (she is a devoted “foodie”), traveling globally, listening to music at live music venues (she is a classically trained pianist), and perusing art at the Chelsea galleries, MOMA, and the Guggenheim. She is also dedicated to living well through healthy eating, cycling, skiing, and yoga/meditation.